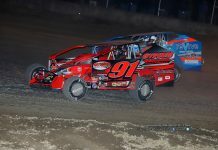 VERNON, NY – Matt Sheppard grabbed his second win of the season at Utica-Rome, winning the Jan Corcoran Memorial in convincing fashion. The Waterloo, N.Y., dominated the race to earn $3,064 for his efforts. Rocky Warner took command of the field at the drop of the green flag for the 50-lap affair, but Warner’s lead was short lived. Coming to complete lap two, sixth-starting Sheppard drove right on by Warner and into the top spot. Once out front, the defending track champion rode off into the sunset, quickly opening up a massive gap over Warner and Marc Johnson. With 15 laps in the books, Johnson was hounding Warner for the runner up position, searching both high and low. However, that battle was taking place a full straightaway behind Sheppard, who was already in thick lapped traffic. Behind Warner and Marc Johnson, Danny Johnson rode in fourth, with Pat Ward, Billy Dunn, and a rim-riding Peter Britten fighting over fifth. By halfway, Sheppard’s advantage had reached half a lap. After miles of trying, Marc Johnson finally slid around Warner for second, while Britten climbed around teammate Danny Johnson for fourth. Soon after, Britten stole third from Warner, running the extreme top of the speedway. As the lap counter ticked 30, Sheppard was still motoring away. Lance Willix came to a halt to draw the only yellow of the race with 31 laps down, erasing Sheppard’s massive eight second lead. This allowed Marc Johnson and Britten to close up to Sheppard’s rear bumper, but Sheppard pulled away again when race pace resumed. Johnson and Britten went to war for second, with Johnson down low and Britten still up high. Meanwhile, Erick Rudolph had snuck his way up to fourth from ninth in the late stages. Eventually, Britten was able to wrestle second away from Johnson, but by that time the white flag was waiving and Sheppard was far away. 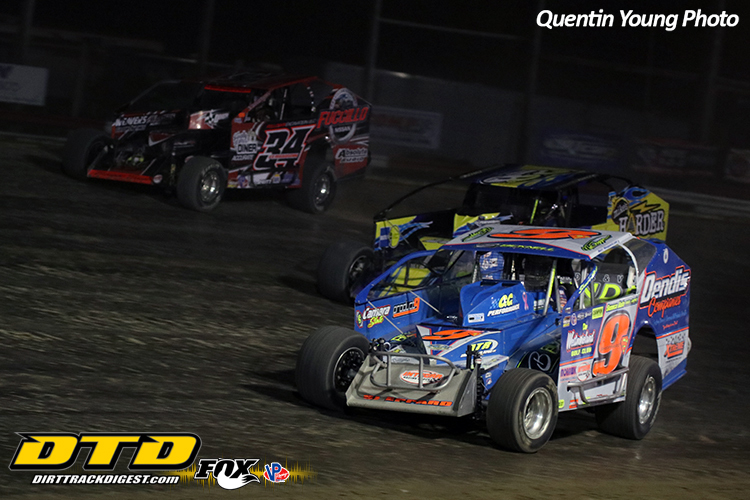 After 50 fast laps, it was Sheppard claiming victory in the Jan Corcoran Memorial in dominating fashion. Britten chased in second, followed by Marc Johnson, Erick Rudolph, and Billy Dunn. 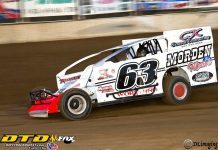 As part of the Jan Corcoran Memorial, the Sportsman also got to race for extra cash. Matt Janczuk snatched the top spot from Kyle Inman off a lap four restart and led the rest of the distance for the big win. In Pro Stock competition, Pete Stefanski would find the lead in the early laps, never looking back en route to the caution free win.